Lt. Robert DuBois (center) handcuffs Tamms Correctional Center inmate Damien Terry (left) before he is taken from his holding cell in 2009. 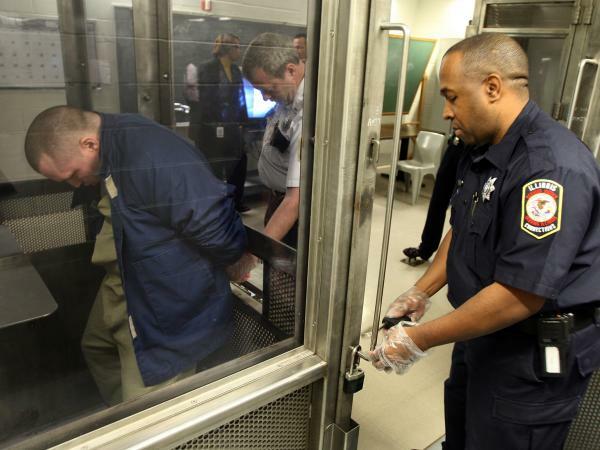 State budget constraints are forcing the facility — Illinois' only supermaximum security prison — to either close or be converted to a lower-security prison. Illinois is the latest state poised to close its only supermaximum security prison, the Tamms Correctional Center. Human-rights groups routinely criticize Supermax prisons for keeping prisoners in solitary confinement for months or even years on end. They claim that many of them suffer from mental illnesses. But that's not the only thing working against Supermax prisons. Some states simply can't afford these elite facilities anymore. The Tamms Supermax is the largest employer in the village of Tamms, Ill., population 632. The prison is housed in a low-lying, nearly windowless building, surrounded by fences and light posts. Inside its tan walls, murderers, gang leaders and the so-called worst of the worst live out their days in long-term solitary confinement. But this prison's days could soon be numbered. The Illinois prison system is bursting at the seams, with about 14,000 inmates beyond capacity. Meanwhile, the Tamms Supermax typically holds fewer than 200 prisoners at a time, costing about $62,000 per inmate each year — about three times the statewide average. It costs $26 million to run the facility each year, according to John Maki, who heads the John Howard Association, a watchdog group that monitors Illinois prisons. "In Illinois, we're broke. We don't have the money to run our state in the ways we have in the past," Maki says. "If we don't close Tamms, I don't know where that money comes from." Supermax prisons experienced a building boom in the 1980s and '90s, largely in response to "get tough on crime" policies. In Illinois, gangs effectively ran some prisons, and violence was epidemic. Toby Oliver, a guard at Tamms, worked at another maximum security prison in 1995, when an inmate stabbed him four times with a shank. He credits Tamms for helping to turn the Illinois Department of Corrections into a "safer environment." But Dan Mears, a criminologist at Florida State University, says it's unclear whether Supermax prisons actually reduce violence in the general prison population. He argues states typically built them without a clear sense of which inmates were causing problems. "You remove a gang member or a gang leader from a facility and put him in, say, Tamms," Mears explains. "It's not like the organization they belong to disappears. Someone else steps up to the plate, and it's more than conceivable that all the gang activity remains the same as it was prior to removing the gang leader." While budget problems loom large in Illinois, lawsuits, human-rights complaints and new research are all leading other states to give their Supermax lockups a long, hard look. Mississippi recently cut its solitary population by nearly 90 percent. Colorado reduced its numbers from 1,500 to about 900 over the past year and will shut down a facility that's only two years old. In Maine, the corrections department adopted several reforms establishing stricter requirements before sending prisoners to solitary. Inmates at the Supermax earn privileges for good behavior, and before returning to the general population, they go to workshops to address the behavior that put them in solitary in the first place. Joseph Ponte, commissioner of the Maine Department of Corrections, says he has to give his personal approval for long-term solitary confinement. "You know, we didn't just do this change to make somebody feel good," he explains. "We didn't do the change for budget reasons. We did it because we thought it was a more effective way to manage these inmates, and the proof's in the data. The data says that it's working." Since the reforms were enacted, Maine's segregation unit has dwindled from 130 to about 40 inmates. Violent incidents in the general population have also decreased. Back in Illinois, state legislators have proposed converting Tamms into a lower-security prison. Either way, the lockup's days of housing the worst of the worst are likely coming to a close soon. Copyright 2012 KRCU-FM. To see more, visit http://www.krcu.org.